I often hear my students describe their misses on the golf course at the beginning of a lesson. It is fair to say most students have difficulty understanding the root causes of a ball, which misses left. With the help of Trackman, let’s discuss the forces driving starting direction and curvature to better understand how the ball ends up missing left. First, there are a few Trackman terms we need to define in order for you to get the most out of this golf tip. Club Path: Club Path is responsible for the curvature of the golf ball. Club Path is the movement of the golf club the last few inches prior to and immediately following impact. A Club Path moving to the left is considered negative (-) and one moving right is positive (+). Face Angle: Face Angle is the driving force for where the golf ball starts in relation to the target line. It is simply where the Club Face is pointing at impact. A Face Angle pointing left is shut and would show up negative (-) and a Face Angle pointing right would be open and show up positive (+). In this scenario, a player hits a shot starting left of target and travels straight on that line for the duration of the shot. Notice in the shot below, the player’s Club Path is -3.1 and Face Angle is -3.4. When Club Path and Face Angle are negative and match or are very close together, a player will hit a pull. This miss looks incredibly similar to the next scenario we will discuss. Learning to distinguish the two is an extremely important step to understanding one’s ball flight. Again, in this scenario, a player hits a shot starting left of target traveling straight on that line for the duration of the shot. Notice the difference this time. The player’s Club Path is 0.2 and Face Angle is -4.3. When Club Path is 0 (traveling down the target line) and Face Angle is negative, the player will hit a pull left. The resemblance of Scenario’s A & B to the naked eye is striking, almost identical in fact. 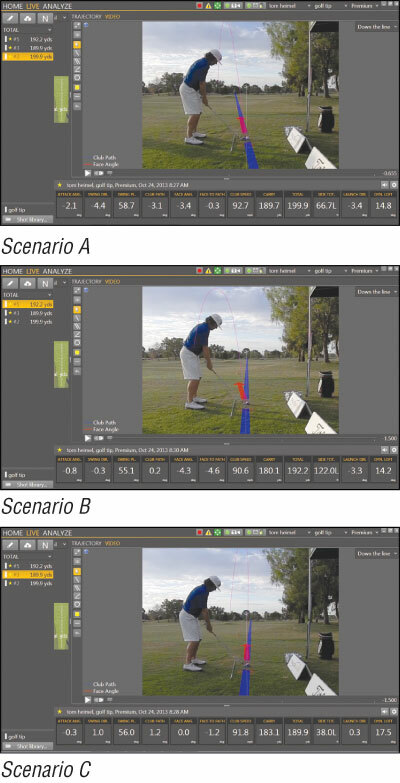 The difference comes from seeing the numbers on Trackman and correlating a feel to that specific flight. For this reason, the time a student spends on Trackman is invaluable. Learning to distinguish each of these left misses from one another is paramount in understanding your own ball flight and improving course management while playing.